Overwatch and Diablo announcements might be in store for BlizzCon 2016. 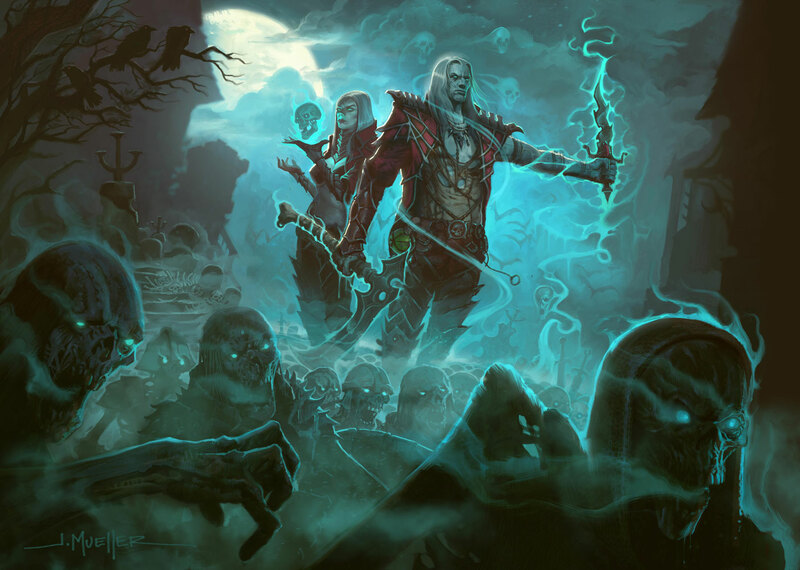 [UPDATE] Reddit user john_kennedy_toole discovered that Blizzard's site may have also leaked new Diablo III Necromancer art. Check out the art right here. An image of Sombra, the new Overwatch character Blizzard is expected to reveal later this week, has appeared online. The art was found on the server for Blizzard's official Overwatch merchandise store. The image is signed by John Polidora, who is listed as a "Blizzard/Overwatch illustrator, concept artist, and character designer" on ArtStation. Although it has since been removed, the image has been reposted on Imgur (via Reddit). Sombra is shown standing on the hand of giant Omnic, with threads of energy linking her hands to the fingers of the Omnic. This suggests she is exerting some sort of control over the giant robot, which could translate to gameplay in interesting ways. Although Blizzard hasn't officially detailed Sombra yet, fans have speculated she'll be a hacker and advanced tech user, based on the in-game teases and various teaser websites that Blizzard has created. It's still unclear which class grouping she'll fit into. The pose she's striking in the image is similar to the one depicted in a previous leak (below), which was featured in the same document that also correctly detailed the Overwatch Halloween event. Blizzard is expected to show off new Overwatch content during BlizzCon 2016, which kicks off on November 4. There's also a chance that something new could be revealed today to coincide with the Dia de los Muertos Festival, which ties into Sombra's Mexican origin. On October 28, a post on the Overwatch blog mentioned Los Muertos, a fictional gang in the Overwatch universe, is "organizing a protest to coincide with LumériCo's unveiling of the Dorado nuclear plant on November 1st," which could be hinting at a map. BlizzCon is completely sold out, but you can watch the event by purchasing a BlizzCon virtual ticket for $40. In addition to the press conferences and announcements, you'll also get to watch "Weird Al" Yankovic perform from the comfort of your home. In related Blizzard news, 2016 also happens to be the 20th anniversary of the Diablo franchise. There is a lot of discussion about the possibility of Diablo 4, but this is just a rumor for now.